It is not easy to make yourself focus on the promise when everything looks bleak. But that in no way makes the promise less certain. We had the most amazing weather the entire trip, except for a sudden shower on Sunday afternoon. I went out to the balcony and sat, chatting with one of my daughters on the phone, listening to the rain, staring at the mountain view, and smelling the amazing aroma wafting across the tree tops. The, suddenly — extremely suddenly — so suddenly that I gasped — a gorgeous, bright, deeply hued rainbow appeared before my eyes. The friend I shared the weekend with heard my gasp and hurried to the balcony and was greeted with a sight of sights. The rainbow had become a double rainbow with each end touching a mountain top and the space between the two rainbows filled in with deep gray-ish purple. Oh the camera did not do it justice. We just stared it. And remembered that when the storms pop up and things seem bleak, the promises of God are certain. Perhaps, like today, they will pop out in front of our eyes. Sometimes we get to gasp at the evidence of the promise. 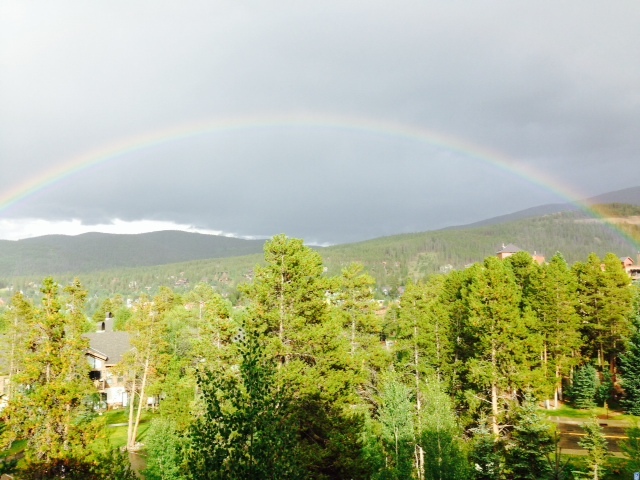 I wondered how many of the thousands of people in Breckenridge at that moment saw the rainbow. Probably not many. Many were working, or shopping, or eating, or getting massages, or a hundred other things. That, however, did not change the fact that the most beautiful rainbow I have ever seen presented itself overhead. If the weekend had nothing but blue skies and friendly clouds, we would not have had those minutes of beauty. The storm brought beauty. As I walk through life and encounter a storm, as I work on my writing and hit a snag, as life’s messiness happens in other areas; I will remember the day I gasped at the physical evidence of His faithfulness as it popped into view in grand splendor right before my eyes. And I will tell myself that even when I don’t see it, it is still there. His promises are certain for every area of our life and they will show themselves at the right time. And so I write, following the calling, trusting His provision and promise. This entry was posted in Inspirational, Writing by PaddleCreekWriters. Bookmark the permalink. I loved this…so filled with promise. Thanks for an uplifting start to the day.